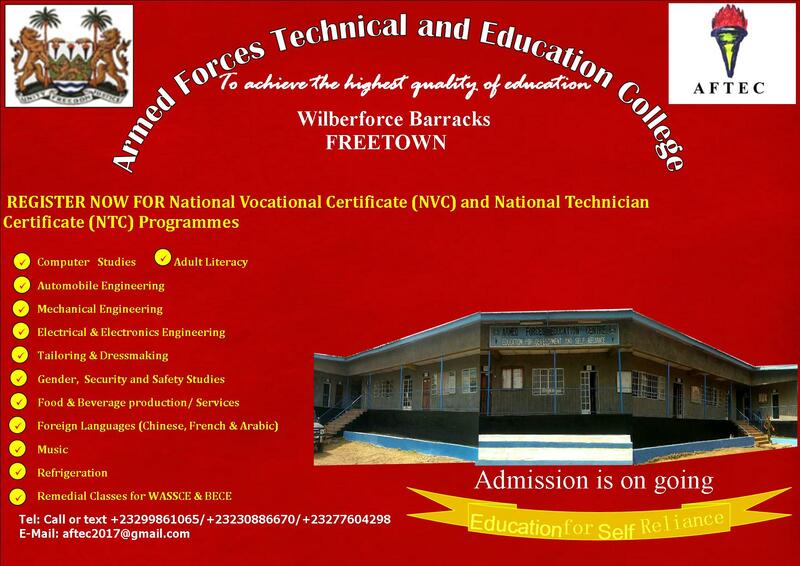 Freetown, Sierra Leone, June 6, 2018 - The Republic of Sierra Leone Armed Forces (RSLAF) has established a technical and education college. The new institution was approved last week by the Tertiary Education Commission (TEC). On the Certificate of Registration dated 30 May, 2018, TEC stated that the Armed Forces Technical and Education College (AFTEC) "having fulfilled all the conditions provided in the TEC Act 2001 has been duly registered as a Certified Tertiary Education Institution". At the Technical Planning meeting held yesterday at the Conference Hall of Armed Forces Educational Centre (AFEC) in Wilberforce, the Commanding Officer of AFEC, Lieutenant Colonel Richard Bockarie said that the mission of the college is to provide quality education for professional career development for military personnel, their dependants and the general public by providing marketable skills, training and relevant tertiary education needed for the advancement of RSLAF and the country. Lieutenant Colonel Bockarie confirmed that the college would start its maiden academic year in October 2018. He stated the college would kick off with such programs as National Vocational Certificate (NVC), National Technician Certificate (NTC) and National Diploma (ND). Highlighting the courses for the various programs of study, Lieutenant Colonel said the courses for the NVC would include masonry, carpentry, metal work, tailoring, refrigeration and music. He added that the NTC courses would cover business studies, catering, computer science, automobile technology, building technology, electrical and electronics technology, mechanical technology and fashion and designing. He further added that the courses for ND would cover business administration, electrical and electronics engineering, accounting and finance, food and beverage production, software programs, computer hardware engineering, mechanical engineering, building and civil engineering, automobile engineering, fashion and designing and nursing (Diploma). Giving his contributions, the Director of National Council of Technical, Vocational and other Academic Awards (NCTVA), Alhaji Mohamed Jalloh commended the RSLAF leadership for the brilliant move for introducing an education for self-reliance in the country. He added that the various courses would help both military personnel as well as the public to acquire skills that would position them to meet future employment challenges.